Long living room ideas are sometimes in short supply. It’s a layout that’s probably the trickiest of all, because of two big conundrums – how do you fit all of your furniture and accessories in so that it does everything you need, and how do you stop it from feeling claustrophobic and difficult to manoeuvre around? But just know that it is possible! This Elicyon space is proof. These narrow living room ideas should help you rise to the challenge of this configuration so that it rivals more coveted rectangle living room designs. Whether you have already chosen the furniture or not, knowing how and where to place every piece can be the hardest aspect of designing a narrow living room. This is true for any shape of living room, but long lounge ideas really do start with establishing different pockets of use. Long, narrow living rooms actually give you a big opportunity to use every part of the floorspace wisely, which can be hard to do sometimes in a large, rectangular living room layout; you often end up with a chasm of dead space in the centre. Think about defining a cosy, intimate seating area at one end and a dining space at the other to transform it into an open-plan area. Or, a television-watching area at one end with a more conversational layout of sofas and armchairs at the other, with additional furniture separating the two zones (be it a large console or even a tall bookcase). They can help you see these zones as two different rooms altogether. Zoning should help you to fill all of the space in a long living room, but it’s still wise to be mindful of the middle section. 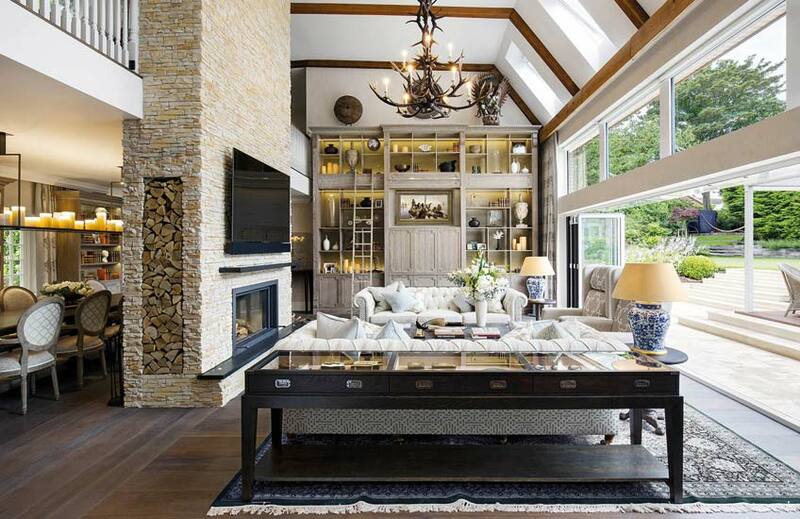 Living room layout ideas for a long room should all encompass ways to prevent a void. Not only is it a waste of precious space, but it makes your room visually off-balance and the design will always appear awkward, ultimately affecting how much you’ll enjoy spending time there. Rectangular living room layout ideas can be enhanced by various design tricks to make your space either feel bigger than it is, or that celebrate it for what it is – long and lean. One of the narrow room ideas that works when there’s ample width to play with concerns maximising the effect of symmetry. If you can choose narrow furniture like slender sofas and coffee tables, place them opposite each other. The effect of having two of each makes you focus on how wide the area is. It’s not commonplace to have that arrangement in sitting rooms so seeing them will be instantly interpreted as a luxury. Mirrors are renowned for being room enlargers when hung in thoughtful ways. A rectangle living room idea where the space is on the narrower side would be to choose several tall and thin mirrors and hang them side by side like you would with panels of art. It’s a more elegant way of creating a mirrored wall but has a similar result of reflecting a large expanse of the room. A mirror over the fireplace – this time a round mirror so you have a combination of circular and square – provides additional light and space. Try not to fall into the trap of using only sharp, clean lines in a long and narrow room. They call out instead for a mixture of crisp and curved. 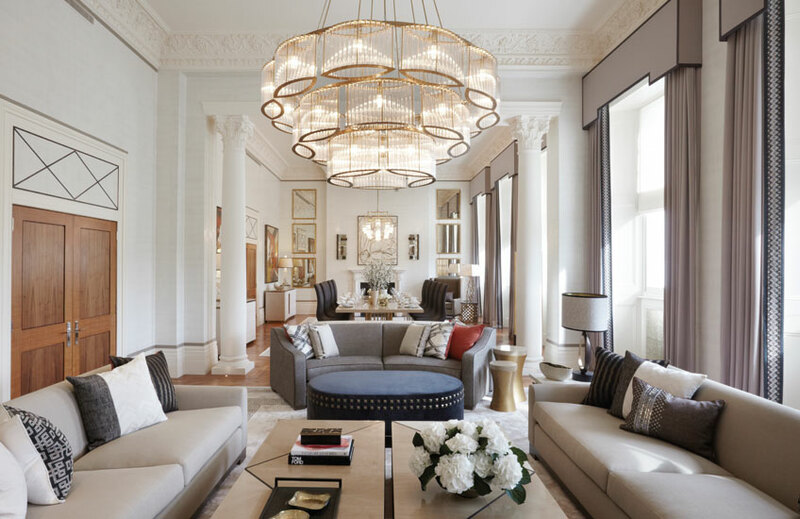 So be sure to select at least a few pieces in the room that are circular or oval, like a round coffee table or ottoman or round-based or drum-shaped lampshades that will all minimise the bowling alley lengths of a narrow sitting room. There are a number of long and narrow living room ideas that involve furniture and accessory choices. The right combination in the right layout will serve on function and form in one of the most-used parts of your home. It doesn’t always come naturally to know how to spread your furniture across all of the walls in a slim, rectangle living room, and that’s where corner sofas come in. They’ll cover part of one of your longer walls and one of the shorter ones without you needing to think twice about it. They also conveniently tuck into the corner so they won’t encroach too heavily on floorspace either while providing you with plenty of seating room. Rugs in a long living room will also help you to create zones. You can use them to mark out the different areas and then arrange the furniture around them. When interior designers suggest using multiple rugs in a room to add warmth and contrasting textures, a narrow living room provides the perfect opportunity. Having a rug for every zone can feel too formulaic though so depending on the dimensions of the room, try to have just two large rugs and perhaps one smaller one beneath a drinks trolley or a semi-circle one to draw attention to and around a console table. Ultimately, it’s prudent not to not have a rug for every single zone. The tables that you choose to have in a narrow living room should generally be slim because they’ll make your room feel larger for no reason other than they’re less obtrusive and visually weighty. By taking up less room, it’s an open invitation to feature more occasional tables too. Picture a slender end table at each side of the sofa, taller than arm height for added elegance, along with shorter side tables aside an armchair and an artful application of console tables, such as sofa tables. This is when you position console tables behind a sofa in the centre of the room so that there is a spectacle on the reverse side as opposed to just a sofa’s back. This is a helpful furniture layout for rectangular living rooms with a fireplace as you might not wish to have a coffee table in front of the fire. Thus, the sofa table gives you another chance to introduce a table surface to the room. Long, narrow living room ideas extend beyond zoning and furniture options. There are a number of extra aspects to keep in mind so your space reaches its full potential. Rectangle living room furniture arrangements that are on the tall and skinny side need to have their items of furniture spaced along the walls. Don’t keep them all dotted down one of the longer walls or it’ll make your room feel like a long corridor. You should encourage traffic flow to move in an elongated S shape of sorts with furniture backing onto all four walls if you can. This suggests to people to move through the entirety of the space through a clear, natural walkway. And by positioning some furniture lengthways and some widthways, you’ll give the illusion of the walls being further apart than they are. Long furniture across the long walls alone will only highlight the narrowness of the room. Pale walls are the general advice in a narrow living room but don’t neglect using brighter bursts of colour and busy pattern. In smaller doses, they not only prevent your decor from feeling flat, but they pull your eye in different directions so that it takes in the full expanse of the room. The more there is for the eye to read and the more you’re encouraged to look and move around the space, the more ‘full-bodied’ your room will appear.